In October 2018, the Intergovernmental Panel on Climate Change released the Special Report on Global Warming of 1.5°C, describing the expected impacts of 1.5°C and 2°C of warming and outlining global greenhouse gas emission reduction pathways that could limit warming to those levels. How much warming has already occurred, compared to the 1.5°C threshold? What are the anticipated global consequences of additional warming? What are the implications for Washington state? How much more warming is likely to occur, given current emissions patterns and policies? What are the options for limiting warming to 1.5°C or 2°C? Snover, A.K., C.L. Raymond, H.A. Roop, H. Morgan, 2019. No Time to Waste. 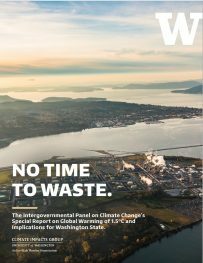 The Intergovernmental Panel on Climate Change’s Special Report on Global Warming of 1.5°C and Implications for Washington State. 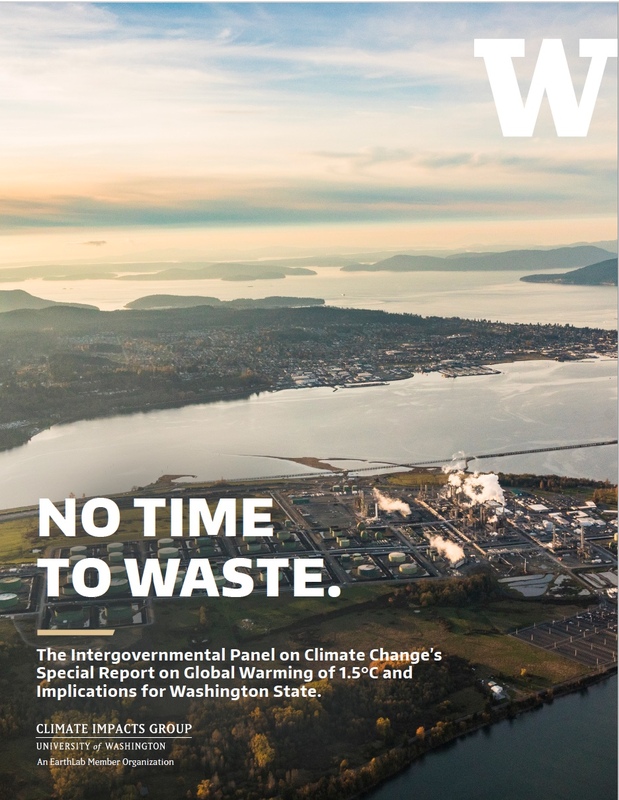 Briefing paper prepared by the Climate Impacts Group, University of Washington, Seattle. Technical changes made in the version updated 02/2019 include: Figure 1: correctly labeled y-axis values up to 400ppm; Figure 5: added “(at 2100)” to the sea level rise icon to provide temporal context. Last paragraph of text on page 5 updated to read “pre-industrial (1.9°C (3.4°F) above the 1970-1999 average)”. To download the report figures, click on the figure you want then right click and select “save image as” to save to your device. You can also download a folder with all of the figures below. Please cite the Climate Impacts Group when using these figures. See the contact information below if you have questions about the briefing graphics. Figure 1: Measurements of air trapped in Antarctic ice and direct measurements of the atmosphere show that atmospheric CO2 concentrations were less than 300 parts per million (ppm) for at least 800,000 years prior to “present” (1950). Because of human activities, such as fossil fuel combustion and land-use change, atmospheric CO2 levels are now above 405 ppm. Data from: Lüthi et al. 2008 (Nature 453:379-82); NOAA (www.esrl.noaa.gov/gmd/ccgg/trends). 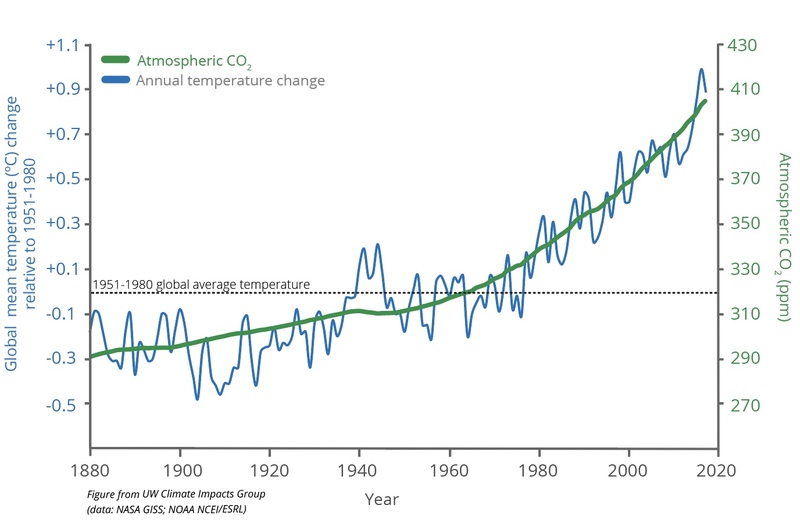 Figure 2: Since the industrial revolution, atmospheric concentrations of CO2 and global temperatures have increased significantly as a result of human activities. Atmospheric CO2 increased from about 290 ppm in 1880 to over 405 ppm today, as shown by the green line. Over the same period, global temperatures increased approximately 1°C (1.8°F) – the blue line shows global annual temperature compared to the average global temperature for the period 1951-1980. Data from: NASA (data.giss.nasa.gov), NOAA (www.ncei.noaa.gov/access & www.esrl.noaa.gov/gmd/ccgg/trends). Figure 3: Human activities have caused approximately 1°C of global warming since pre-industrial times (1850-1900). 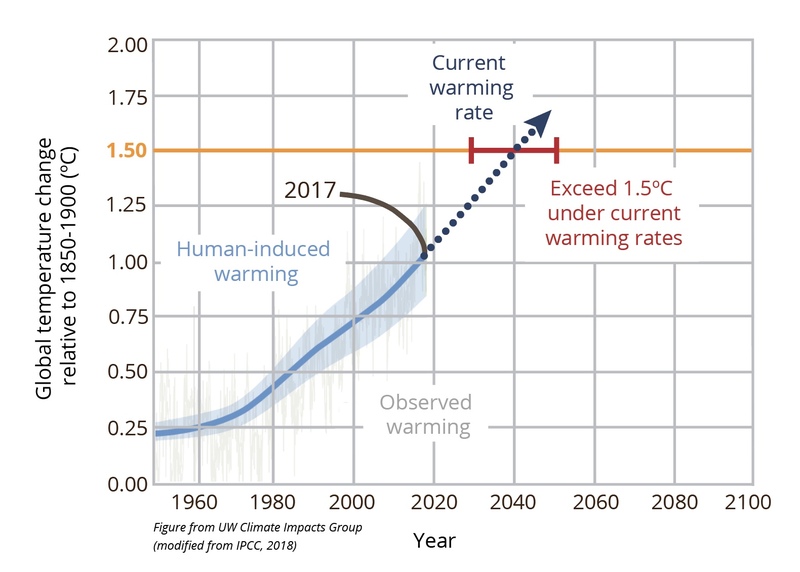 If current rates of warming continue, global warming could reach 1.5°C as soon as 2030 (2030-2052). Figure modified from IPCC Special Report on 1.5°C (Chapter 1, FAQ 1.2, Figure 1). Figure 4: Half a degree of warming makes a big difference, as shown in this summary of the global impacts of 1.5°C and 2°C warming. 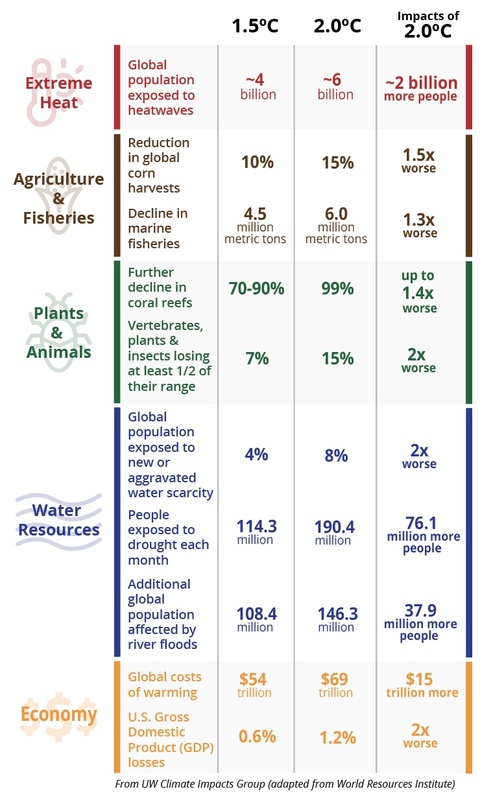 Figure adapted from World Resources Institute. Data from: IPCC Special Report on 1.5°C. Figure 5: Warming of 1.5°C will bring increasing challenges to Washington. (The figure shows projected changes in hot days relative to 1976- 2005, changes in sea level rise relative to 1991-2010; all others relative to 1970-1999.) 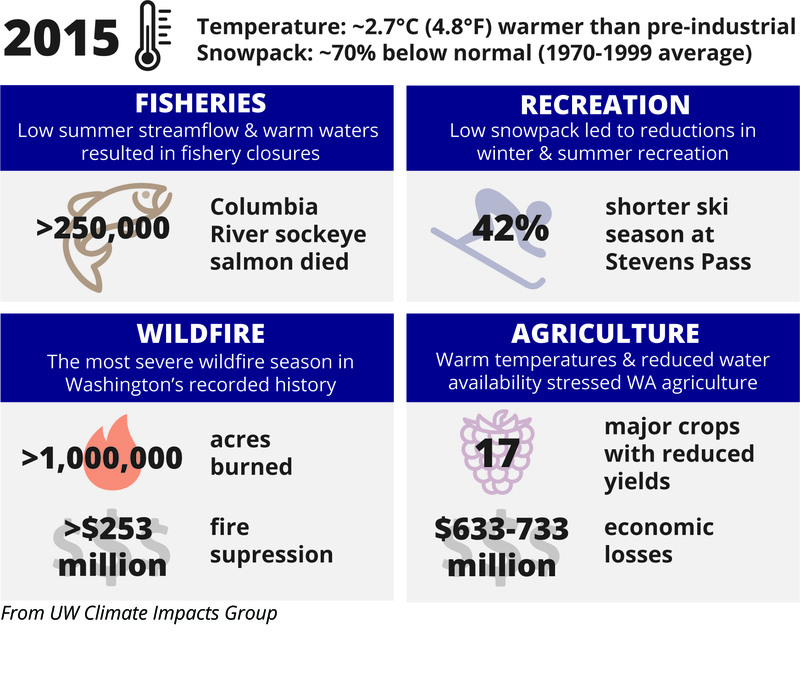 Data from: Fourth National Climate Assessment; Climate Change Impacts and Adaptation in Washington State; State of Knowledge: Climate Change in Puget Sound; Projected Sea Level Rise for Washington State – A 2018 Assessment. 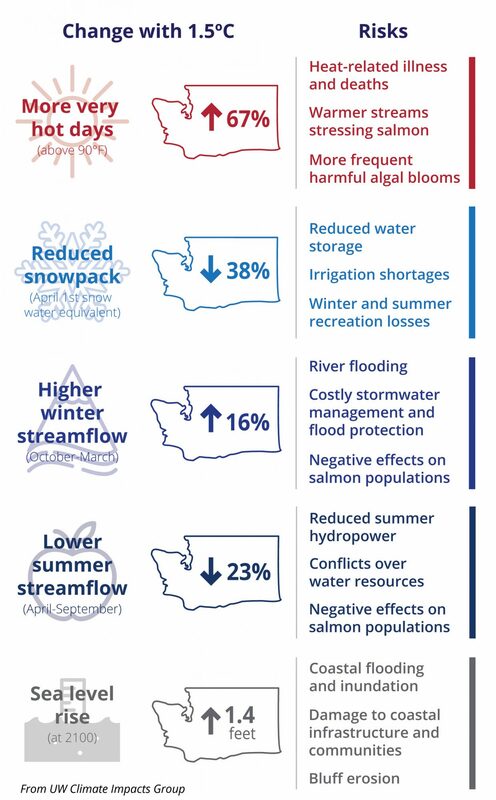 Figure 6: The extreme climate of 2015 provided a preview of impacts likely to become more frequent in Washington state if greenhouse gas emissions are not dramatically reduced. Regional temperatures were about 2.7°C (4.8°F) warmer than pre-industrial and Washington state snowpack was about 70% below normal. Data from: Fourth National Climate Assessment. 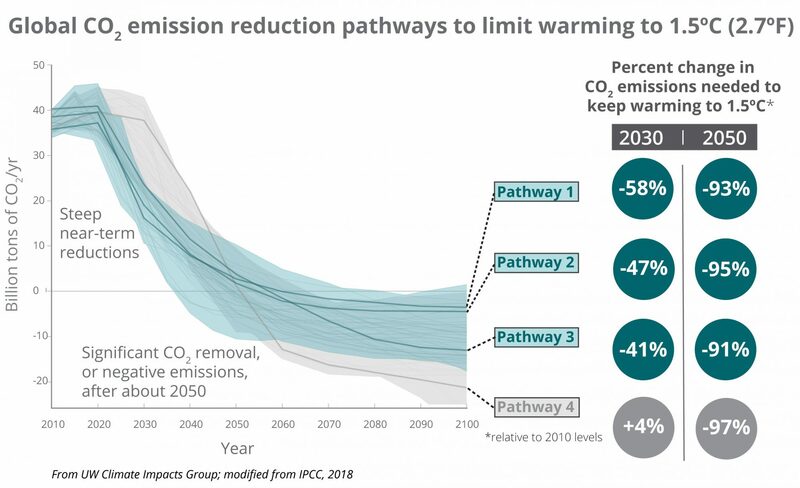 Figure 7: Limiting warming to 1.5°C can only be achieved if action is taken to significantly reduce global CO2 emissions well before 2030 and if global emissions are decreased to ‘net zero’ by around 2050, as shown in the blue shaded area and by Example Pathways 1-3. 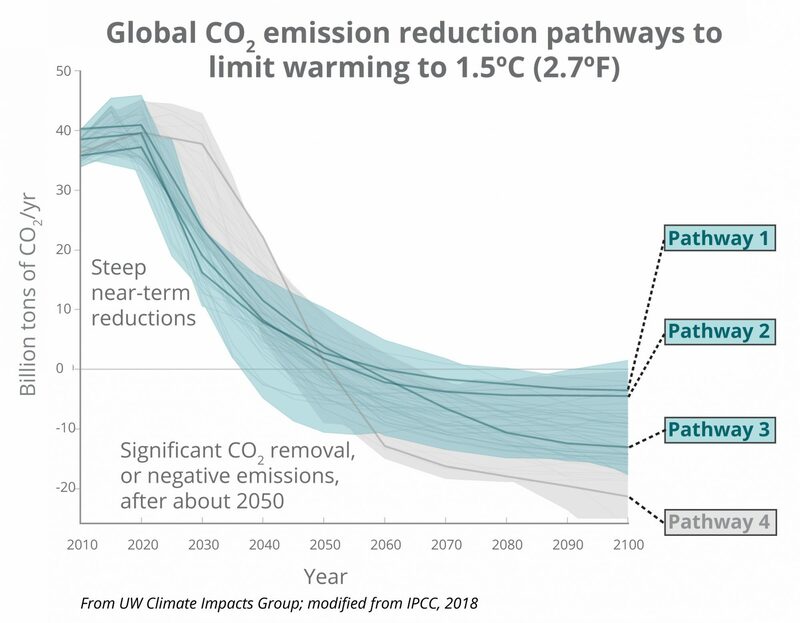 The gray shaded area and Pathway 4 show CO2 emission pathways that would lead to global temperatures “overshooting” 1.5°C for a few decades and returning to below 1.5°C before 2100. All pathways require “rapid and profound near-term decarbonization of energy supply” and some amount of atmospheric CO2 removal. Figure modified from IPCC Special Report on 1.5°C (Summary for Policymakers, Figures SPM.3a & SPM.3b). Figure 7 is also available as two panels: Figure 7 left panel only; Figure 7 right panel only. Please contact Amy Snover and with questions about this project. For questions about the figures and tables, please contact Heidi Roop.